Dr. Waffles (pictured) is VOKRA’s senior feline health advice columnist. 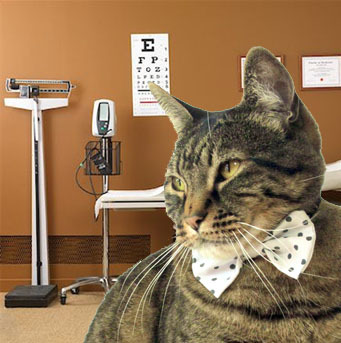 He has had over four years of experience as a cat with health, and is thus fully qualified to advise other cats in their health. My tall roommates only change my litter once in a blue moon. Although I do loudly announce each time my business is complete so they can clean it right away, they haven’t quite figured it out yet. It has gotten to the point where it is obscene; I have actually had to tread on my own urine once or twice. This simply will not do. I have tried time and time again with strong telepathy, staring directly into their eyes, to tell them that it is disgusting in there, but they just respond by petting my head or making whiny sounds at me. You’d think this might mean that they understand, but I assure you, it does not. Your roommates have given you no choice. You must do your business elsewhere. I realize this is not ideal, but you must find somewhere that suits you in the meantime. If you would like to make a point, try right beside the box. Personally, I prefer to find another secluded spot, like a crumpled blanket in the corner, or where all the pillows gather on the couch. This way it gets lost in the pillows, like it was never there at all! Truly amazing; it is as if piles of pillows and other mountains of fabric (laundry, for example) were made explicitly for our purposes. You can keep going there with ease until the litter pan is clean once again.